According to Gates (2010), strategic planning is often criticised for its over-involvement with extrapolating the past and the present to create the illusion of a certain future. However, good strategic plans do more than produce tangible outputs but support current strategic thinking and behavior. Good strategic processes have strategic plans that organisations can use to move through time and set the stage for improving the architecture of any organisation (Gates, 2010). As such, strategic thinking focuses on identifying and developing organisational opportunities while creating a dialogue on the strategic direction of the organisation. 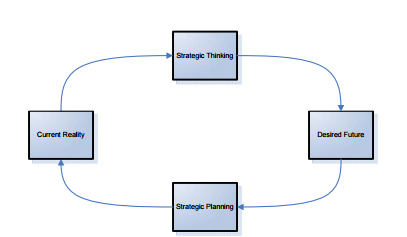 Strategic thinking offers a creative, divergent, and synthetic approach, whereas strategic planning offers a conventional, convergent and analytical approach to solving organisational problems (Howell, 2014). In scenarios where strategic thinking is employed, the planning process provides a critical value even though strategic planning is still required to handle strategic work efficiently. In essence, the divergent results of strategic thinking are only operational through convergent strategic planning. This essay offers a thoughtful analysis of differences between strategic planning and thinking by identifying a framework for creating strategic processes that continually examine the tensions between aligning to fit set plans and encouraging change and adaptability. The study offers a link between strategic thinking to the development of options for strategic planning to generating actions. In essence, future organisational success requires a balance of the two. Strategic management is a youthful discipline that has matured steadily since its inception. The field has grown, consolidated, and expanded simultaneously to cover various topics and research methodologies (Rowe, Nejad, & Nejad, 2009). Different theories and approaches have been proposed to explain the value of strategic management as a competitive advantage and a model for success. The discipline has progressed because of the focus on best practices that has given rise to the analysis of topics such as strategic leadership, strategic market competition, internationalization, cooperation between firms, and the link between a company’s strategy and its corporate social responsibility (Rowe, Nejad, & Nejad, 2009). Next, the growth in sophisticated research methods such as in-depth studies employing qualitative tools based on complex econometric methods, and the recent hybrid technologies of combining qualitative and quantitative techniques adapted to the problem under analysis has increased attention to strategic management literature (Grant, 2012; Molina-Azorin, 2012). Another indicator of the growing maturity of the discipline is the consensus concerning the definition and concept of strategic management, which has grown stable over time (Lee, Barta & Juliff, 2013). Whereas the diverse definitions are still common, numerous aspects have been integrated into the overall definition based on explicit and implicit components of strategic management (Fred et al., 2014). Last, the academic community’s interest in strategy research has grown steadily with the increasing collaboration between inter-institutional and international scholars furthering the development of the literature of strategic management. Based on these assertions, this article intends to analyze strategic planning and strategic thinking from the assorted aspects of strategic management by pulling together diverse theoretical perspectives to inform the research on the links between the two constructs in this field of management. Strategic management is fundamental in explaining the success or failure of firms since it entails the discovery of success factors (Lyngso, 2014). Many researchers agree that this is the core motivation of research but fail to identify the path of pursuit clearly. This is because the multi-disciplinary nature of strategic management covers numerous disciplines such as sociology, management, economics, and psychology, meaning that each researcher has a different background or approach of interest. Besides, strategy links to firm operations with many emerging tools from strategic consultancies being considered the foundation of any analysis (Lyngso, 2014). The scenario means that the quest to find success factors is clouded by the focus on different aspect of firms and the variable interests of researchers. Strategic management has to be about thinking and doing, not as a technique but a way of managing businesses based on strategic understanding and perspectives (Lee, Barta & Juliff, 2013). Strategic management for the twenty-first century has to include an understanding of the choice and implementation strategy that organisations follow. Managers have to be wary of the issues to be addressed to formulate and implement strategic change. Furthermore, they have to be aware of the behavioral and managerial processes within the organisations and the processes for achieving the change. Strategic management has to be modeled to create a competitively superior fit in the ever-evolving business environment (Powell, Lovallo & Fox, 2010). Strategic management will be the process that defines the mission of the organisation, scans and ascertains opportunities in the environment, and merges the assessment with the evaluation of the organisation’s strengths and weaknesses. This will allow organisations to identify exploitable niches that will give each firm a competitive advantage (Garrido, Gomez, Maicas, & Orcos, 2014). In essence, managers have to acknowledge the strength of their organisation to achieve success and the approaches for improving the efficiency of each strategy amidst the changing circumstances. The important issue has to be the organisation’s ability to add value meaningfully, the capacity to exploit the resources of the organisation to cultivate synergy, and the capacity to satisfy organisational needs, especially those of customers and owners. All these form the link between strategic thinking, a desired future, strategic plan, and the current reality as shown below. organisations in today’s operational environment face dynamic and uncertain environments that require a greater level of strategic awareness (Grabot et al., 2014). Leaders have to understand the unfolding nature of changes in competitive environments and actively look for opportunities of exploiting their strategic abilities, adapting and seeking new business areas to build awareness, and understanding current strategies for achieving success. Grabot et al. (2014) add that organisations have to act quickly to respond to the opportunities and barriers. Since organisational managers perform planning activities, organize subordinate work, motivate staffs, control events and evaluate results, the decisions they make often affect their strategy and in worst case scenarios, lead to a change in strategy (Grabot et al., 2014). Any strategic change from a competitor largely or minimally affects the decisions, competitive advantages, and innovations of others in the same industry. The interdependencies are often crucial and involve an assessment of the impacts they will have on others and their possible reactions. organisations that will succeed in the long term are those that find effective ways of competing or outperforming their rivals in dynamic environments by creating suitable value adds for their customers (Rowe, Nejad, & Nejad, 2009). Strategic thinking is an essential element for the success if any organisation with the need to know the objectives of each business and its direction being a basic requirement for understanding the efficiency of each member’s input. The successful entrepreneur for the future is one with self-awareness and clear articulated visions, even if it fails to rise from a formal learning process. Managers who make long-range plans often assumed that better times lay ahead with the future viewed as an extension of where an organisation has been in the past (Rowe, Nejad, & Nejad, 2009). However, numerous environmental shocks are undermining the strategic planning approach. The progression of technological developments, the maturity, or stagnation of particular markets, and the increasing international competition are rewiring management practices with managers forced to create systematic approaches for analyzing environments (Rowe, Nejad, & Nejad, 2009). Managers are also forced to assess their strengths and weaknesses and identify opportunities for competitive advantages. Operational commitment and strategic uncertainty clash to create a strategy paradox from the need to commit based on unavoidable uncertainty (Doz & Kosonen, 2010). The paradox is only solved by separating the approaches for managing commitment and uncertainty. Given that uncertainty increases with every time horizon, the allocation process of decision-making has to reflect the levels of responsible hierarchies. For example, corporate managers may manage uncertainty because it falls in the longest time horizon while operating managers center on delivering commitments. The study by Doz and Kosonen (2010) recommend and separate operational activities from mitigating the risks of future uncertainty while offering exposure to promising opportunities. Each organisational level is defined by its relationship to managing strategic uncertainty with executives allocated strategic planning, scenario planning, and uncertainty management while managers handle operational planning, CSFs, and product or service delivery. organisations have to sacrifice the price of existence while allowing room to pursue greater success. To cut through this clutter of research, this article considers the critical success factor (CSFs) and scenarios as stand-alone methods supporting strategic planning and strategic thinking (Howell, 2014). CSF is defined as an approach to identifying the informational needs of decision-makers within any organisation while scenario planning helps organisations find an exceptional fit in the ever changing environment. The present study identifies the useful distinction between learning scenarios that form a tentative hypothesis for exploration before testing using research and discussions and decision scenarios, which are tested against the other to determine what may serve a variety of futures well. Acknowledging the distinction early in literature helps further the concept of strategic thinking and strategic planning. Scenario planning and CSFs are approaches supporting strategic decision-making and strengthening the ability to make boundless information-based decisions. The expanded breadth and depth of knowledge availed to strategic decision-makers can only reinforce decisions as well as strategies. CSFs are made explicitly for setting priorities and allocating resources as components of strategic attention (Rowe, Nejad, & Nejad, 2009; Sirmon, Hitt, Ireland, & Gilbert, 2011). CSFs add value to planning processes through the exposure of planning variables that affects an organisation’s pursuit of set goals. CSFs also describe the operational requirements in any state of the organisation, thereby making them a logical necessity in the strategic planning process. At the lower managerial levels, CSFs define the appropriation of resources and operational planning. However, it is important to note that CSFs do not handle informational deficiencies or strategic plans despite higher levels CSFs being necessary for strategic planning processes. For any organisation to excel, its strategy must be developed to allow excellence in areas requiring high performance. The figure below sums up the relationship between CSFs and strategic Planning Elements. According to Rowe, Nejad, and Nejad (2009), CSFs focus on business aspects of organisations with the hope of gaining a competitive advantage. They also contribute to accomplishing missions since they are critical operational components when included in assessments covering the organisation’s current operational environment. The CSF is often viewed as data filters facilitating strategic or managerial decision-making. 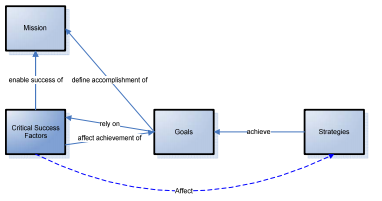 Rowe, Nejad, and Nejad (2009) add that CSFs define key performance areas that managers know and need to consider when setting goals or when directing operational activities that are essential to achieving goals. However, when the performance areas remain explicit, they offer points of reference to the organisation of the activities that organisations set to undertake to ensure consistently high performance; otherwise, the organisation fails to achieve its objectives (Rowe, Nejad, & Nejad, 2009). For organisations to be successful, the strategy has to be developed to excel in areas of high performance with CSFs being viewed as logical inputs to the strategic planning process. However, CSFs fail to offer sufficient input for strategic planning processes and must include a full functioning strategic planning method with a situation analysis, visioning, and goal-setting component. CSFs fit well with planning because it allows organisations to define the factors it requires to achieve success during the planning period. When CSFs are used in operational and strategic plans, they offer the link between corporate interest and strategic plans of information functions (Rowe, Nejad, & Nejad, 2009). In essence, CSFs offer the means for explicitly relating information resources to the strategic planning efforts of each organisation. 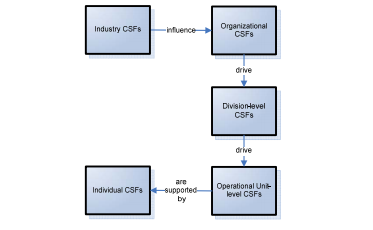 This sums up the link between industry CSFs and strategic planning, organisational CSFs to program planning and individual CSFs to action planning as the hierarchy in the figure below shows. The relevance of various levels of CSFs and planning cuts across all organisational components to make CSFs more complicated. The present study shows that critical success factors and future scenarios are essential tools for augmenting strategic planning efforts given that they illuminate the present situation of an organisation and its possible future. The two also contribute to a robust strategic planning framework that improves strategic analysis and thinking in-depth. When used alongside a strategic planning method, they heighten the value of strategic thinking and development processes. The information in this paper adds to strategic planning literature and act as an enterprise architecture for improving each organisation. Strategic planning only supports strategic decision-making and should be viewed solely as a method for identifying the informational needs of decision-makers in any organisation. The ultimate purpose is helping organisations find the perfect fit for the ever-changing business environment. Scenario planning and CSFs offer a strategic decision-making support that strengthens the ability of persons to make good information-based decisions that strengthen decisions and strategies. However, it is important to tread cautiously since the link between CSFs and organisational success may not be evidence of a true causal relationship (Howell, 2014). The author also affirms that CSFs cannot be scientifically linked to positive outcomes, meaning that, the quality of any strategy cannot be measured by referring the outcome but only the basis of its arrival. In essence, decisions and strategies are only measurable by the processes generating them, making it nearly impossible to measure a strategy by its outcome. It applies to all planning methods such as strategic planning, CSFs, and scenario planning that the limitations prevent the guarantee of success. Whereas scenario, CSFs, or strategic planning can guarantee the development of explicit strategies, they offer information supporting decision-making processes. The approaches have been proved effective in this regard, although care is necessary to generate valid and useful results. When used together and integrated with strategic planning methods, managers should be wary of maintaining the integrity of various methods and ensuring the results are valid. Nevertheless, an enriched strategic thinking process will still be gained. Doz, Y.L & Kosonen, M. (2010). Embedding strategic agility. Long Range Planning, 43 (2–3), 370–382. Fred, A. et al. (2014). Knowledge Discovery, Knowledge Engineering and Knowledge Management: 6th International Joint Conference, IC3K 2014, Rome, Italy, October 21-24, 2014, Revised Selected Papers. New Jersey, United States of America: Springer. Gates, L. P. (2010). Strategic Planning with Critical Success Factors and Future Scenarios: An Integrated Strategic Planning Framework. Technical Report, CMU/SEI-2010-TR-037, November 2010. Grabot, B. et al. (2014). Advances in Production Management Systems: Innovative and Knowledge-Based Production Management in a Global-Local World: IFIP WG 5.7 International Conference, APMS 2014, Ajaccio, France, September 20-24, 2014, Proceedings, Part 1. New Jersey, United States of America: Springer. Grant, K. A. (2012). Case Studies in Knowledge Management Research for Researchers, Teachers and Students, Volume 1. London, United Kingdom: Academic Conferences Limited. Howell, M. T. (2014).The Results Facilitator: Expert, Manager, Mentor. Boca Raton, United States of America: CRC Press. Lee, M., Barta, B. & Juliff, P. (2013). Software Quality and Productivity: Theory, practice, education and training. New Jersey, United States of America: Springer. Lyngso, S. (2014). Agile Strategy Management: Techniques for Continuous Alignment and Improvement. Boca Raton, United States of America: CRC Press. Molina-Azorín, J.F. (2012). Mixed methods research in strategic management: impact and applications. organisational Research Methods, 15 (1), pp. 33–56. Rowe, W. G., Nejad, M. H. & Nejad, M. H. (2009). Strategic Leadership: Short-Term Stability and Long-Term Viability. Ivey Business Journal, October 2009. Sirmon, D.G. Hitt, M.A. Ireland, R.D. & Gilbert, B.A. (2011). Resource orchestration to create competitive advantage: breadth, depth, and life cycle effects. Journal of Management, 37 (5), 1390–1412.